Datuk Kris Azman Abdullah is the Senior Vice President of the Exploration and Production Division of Sapura Energy. With more than 15 years of experience in the financial services industry, Datuk Kris has worked in Aseambankers Malaysia Berhad, TA Securities Berhad and Pengurusan Danaharta Nasional Berhad in several senior positions. Datuk Kris was also the Executive Director of Issues and Investment Division at Securities Commission Malaysia where he was part of the team responsible for introducing numerous policy changes that made decision-making processes more transparent. In 2010, he was appointed as the Executive Director of Group Strategy and Business Development at Sapura Group of Companies, where he was involved in the negotiations and closing of Malaysia’s first Risk Service Contract oilfield development project in January 2011. 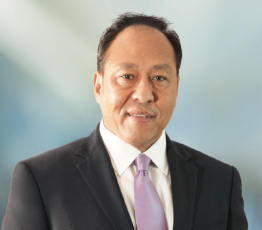 His current portfolio at Sapura Energy includes the development of key strategies and management of the operatorship and partnerships in the development and production of greenfield, brownfield and marginal oil and gas fields, investments and ventures of key production assets, as well as ventures of new field development and production technologies. Datuk Kris currently sits on the Malaysia-Singapore Business Advisory Council and the Malaysia-Brazil Business Council.